The Park is home to a wonderful variety of wildlife including the rare and elusive Bennett’s tree kangaroo, endangered southern cassowary and the beach stone-curlew. 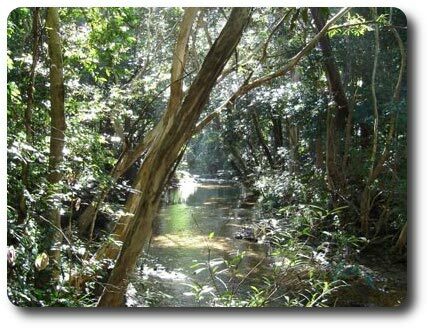 It lies between Cape Tribulation and Cooktown and is accessible only by boat or on foot via the Home Rule Walking Track. Take the turnoff south to Helenvale from the Mulligan Highway, about 2 kms south of Black Mountain. Continue through Helenvale and Rossville. Once in Rossville there is a turnoff on your left to Home Rule rainforest lodge. The homestead and access to Cedar Bay North is 3 kms down this track. The 17km (one way) walking track is a rough, steep and difficult track and should only be attempted by experienced walkers. Walking the track should not be attempted when heavy rain has fallen or is forecast, as it crosses several creeks, and steep sections can become slippery in wet weather. Bush camping is available in coastal vegetation adjacent to the beach. No facilities are provided so campers must be self-sufficient. Camping permits are required and fees apply. Permits are limited and it is recommended that you book at least two weeks in advance.